On Tone 13 we Ascend to a Higher Consciousness of Spirit. Our Ascension is accomplished by a Human Choice to Remember our Identity in Spirit. Ascension doesn’t “happen to us.” We Ascend by aligning our thoughts with the Consciousness of the Creator. Through Intention we Ascend in incremental steps – one trecena at a time, and one Truth at a time. Ascension is an all-encompassing influence in the realms of Mind, Body, and Spirit that Transforms our perspective. The world isn’t changed. The way we see it is changed. As Above, So Below. As we are Transformed to see a world of Beauty, a new world of Beauty will manifest itself. Transformer/CIMI is the sign of a Major Life Change. The CIMI glyph illustrates the face of death as the reminder that something always dies as something new is born. Our Ascension from the Jaguar/IX trecena is a permanent change in the way we see our Self and our Life Experience. We are born into a new life as we die to an old way of being. We Ascend by Seeing what can never be Unseen again. Tone 11 brings the Intention of Resolution and the Clarity for a new Understanding. Tone 11 is dynamic energy that facilitates change, simplification and improvement. Tone 11 establishes an agreement from which we can hereby Resolve to move forward in our new way. Seed/KAN represents family, sexual activity, and the magic of germination. Seed brings the energy to free us from debt or our oppressive patterns of the past. Seed offers the courage to make a profound investigation of our Self, so we can gather what is needed, and place ourselves in the right environment to grow. Seed is said to reveal hidden traps and negative influences. Those born as Seed are defenders of the people, and are capable to navigate around obstacles. 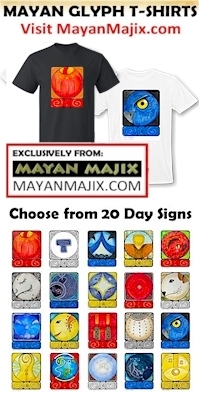 The Cherokee Day Sign, the Dragon, is the energy of Life Force that germinates a Seed. The Dragon is said to help us to see clearly. Seed can help us find our place where Spirit can exist in the realm of physicality. Seed/KAN helps us find the place where we can live in the Truth of our Authenticity. We are called to “Know Thy Self” and make the choices that support who we are. From the principle of “As Above, So Below” we learn our reality is created from what we imagine. Seed calls us to separate ourselves from circumstances that draw us into negativity. It’s our right and responsibility to claim our own fertile soil. Seed/KAN calls our attention to who we were created to be. The Maya honor the Corn as a symbol of the people. Corn was the crop central to the basics of survival, the most important Seed of the Maya. Corn represented the Truth that what is planted on Mother Earth can be multiplied to abundance, always producing a seed of the next generation of itself. They saw beyond the fruit of the one, to fields of corn multiplied to abundance. They recognized the power of a small thing. Tone 7 is the Tone of Balance, reflecting the Spiritual Principle, “As Above, So Below.” This Principle is shared among the most ancient teachings, including the Emerald Tablets of Hermes. The Principle expresses that what exists in one realm, is Balanced in all realms of existence… the mental, physical, and spiritual realms. The Intention of Tone 7 is Reflection. Tone 7 is illustrated as the top of the pyramid, a Holy Place of connection between Heaven and Earth. Sun/AHAU is the Day Sign of the Supreme Creator. AHAU marks the completion of each 20-day uinal that begins on IMIX. IMIX is the Alpha (Position 1) and AHAU is the Omega (Position 20, symbolized as zero). 7 Sun/AHAU is a Balancing carried out by a Supreme Creator. Sun/AHAU brings the Light of Illumination to all things, whether hidden in shadow or hidden in plain sight. Every encounter with AHAU holds the potential for a Divine Revelation. The steps we’ve climbed in an effort of Intention have brought us to a place with a 360 degree view. Through Reflection we will see the distance our Spirit has traveled by Intention. We will recognize that we have arrived at a Higher Place. Today completes the 1st uinal of Germination. The Seed of our new Spiritual Identity is Awakened by the Light of Divinity. Tone 6 offers the Peak Energy of Flow to help us establish a rhythm and pattern of movement. A new effort of Intention takes on the momentum for dynamic developments. Storm/CAUAC brings the energy of the comfort of home. When the storms of life appear, we are naturally inclined to seek a place of safety. This “turning for home” is the rhythm and pattern that CAUAC helps us to establish. CAUAC displays the “lightning force” that connects Heaven and Earth. CAUAC represents a renewal and regeneration of Spirit. Just as lightning nourishes the Earth, so are our Spirits renewed by a Spiritual Force of Regeneration. Storm’s lightning displays a power that is not contained by limits or boundaries. Lightning finds is own way to deliver its gift of Spiritual Energy. It can reach us no matter where we are. CAUAC is a Day of “lightning in the blood” that magnifies our Spiritual Gifts. CAUAC brings a new experience of Truth through our Sixth Sense. CAUAC renews our Consciousness of the Unbridled Power of Spirit. No matter what storms appear, Spirit holds the power to change the landscape of our lives. Tone 4 brings the energy to stabilize our climb of new Spiritual Growth. Tone 4 sets the rules, orientation and parameters of a new way forward. We are given a clearer Sense of our Self, where we are, and where we are going. Earth/CABAN draws us into Oneness with Mother Earth. The Natural World was given to us as the place of our Becoming. CABAN is a symbol of perpetual motion. Our Human transformation flows in synchronicity with her movement, and together we are synchronized within the universal movements of Heaven and Earth. CABAN offers an awareness of ourselves as One in a Universal Movement. CABAN can bring us an experience of synchronicity. We may find ourselves in the right place at the right time for something unexpected. Earth persons help to dispel bad intentions, habits and ideas. CABAN helps us to move on from old ways of Being. The Cherokee Heron is compared to the Phoenix who rises from the ashes of its past. Tone 3 is the first day of Movement. Our Dream is given life as a vibration in the world. At the micro-level of the realm of physicality, atoms that exist in a configuration are excited and shaken apart. All the pieces will come to rest in perfect order in alignment with a Divine Plan. When our Lives seem shaken apart, we exist in the chaos that holds potential for Divine Order. Higher Consciousness holds the Power to rearrange our world. Wisdom/CIB is the Day Sign that reflects the the Ascended Masters and their Collective Wisdom. We Honor them for the Wisdom they preserved so that we can start from Higher Ground. Someday we will be the Old Ones too. The Wisdom of our own Experience is just as Sacred. The glyph represents the Mind in its Highest State of Consciousness, emanating the rays of Consciousness and Forgiveness. CIB reminds us that Forgiveness is the Key to the Kingdom of Spirit. We can learn to See Injustice as the evidence of Human suffering. Mastering the Intention of Forgiveness, the Human Mind is raised to the Consciousness of God.